It is always rewarding to see families being involved with their children’s activities. Whether it is being actively involved or just by going and supporting makes a difference. Our drum corps activity is really another type of family that has had a tremendous amount of family members pass through their ranks. Another good example of this is the Strang family from the Reading Buccaneers. Rich Strang began his drum corps journey back in 1986 when his older brother introduced him to the drum corps activity. Rich was amazed with the corps of that era such as the 1986 Blue Devils, the 1987 Cadets and the 1987 Santa Clara Vanguard. Rich was hooked and he knew he wanted to someday march in a drum corps. 1992 came around and he was turning twenty-one that summer, so he made the decision to march with the Crossmen as a member of the contra section for his rook-out year. Rich was the first and only member of his immediate family to march drum corps up until last year when he marched the Buccaneers with his daughter Michelle. Rich chose the Buccaneers because back in 1992 the Crossmen were directed by Carl Ruocco. In 2005 Carl joined the Buccaneers staff so this made the Buccaneers a logical choice for him when he decided to march again in 2009. Rich feels that the level of competition is what strikes him as the biggest change since he first started marching drum corps. Every year the quality, complexity and excellence of the shows being presented by all of the corps gets better and better. 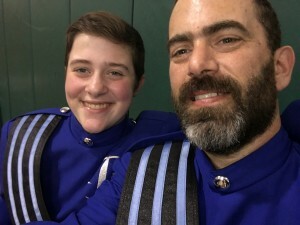 When asked how it feels to march alongside his daughter as a member of the tuba section Rich responded, “It was a cascade of amazing feelings as we progressed through the season. The smile she gave me the first time we played in the horn arc. The sheer fun she had the first time we learned drill together. The joy of putting on the uniform for the first time. The excitement we had marching our first show together. The happiness after our finals performance as this was an incredible experience I will never forget “. Rich has two memorable moments in his drum corps career. For DCI, it was in 1992 when the Crossmen beat the Santa Clara Vanguard for the first time in corps history. That achievement set the tone for the remainder of the season, and ultimately resulted in the highest finals placement and score in Crossmen history. For DCA it was not specific to the Buccaneers, but rather related to the fellow corps within DCA. In both 2009 and 2016 the Buccaneers endured the loss of a member in the middle of the season. He will never forget the outpouring of support and respect received from all of the other DCA corps. This is what drum corps is all about. When asked how it feel to be affiliated with the Buccaneers as a member of a corps with so many World Championships his answer was simple and to the point. Titles are great, but the best thing about being a part of the Buccaneer organization is the journey. The journey is where you grow individually as a person and collectively as a family. The journey is where you learn to push yourself beyond mental and physical boundaries. The journey is where you strive for excellence in everything you do. The journey is where one hundred twenty-seven complete strangers learn to work together with a common goal. At finals every year, Buccaneer members, staff and administrators are presented with a specialized dog tag. The dog tag is designed to represent that year’s journey and serve as a reminder of everything you achieved. If the journey ends in a World Title for the organization that’s great, but for the Buccaneer members the dog tag represents what it means to be successful. Currently, Rich holds the position as Web Manager for the drum corps as he was originally recruited by the corps to update the corps web presence with a new web site. This evolved into acquiring and managing new technologies that made it easier for the administration and staff to perform some of their work. It also helped manage their social media presence and improved communications with their fan base and alumni members. When not doing drum corps Rich enjoys fishing, playing golf, or just sitting on the front porch looking out at the five acre farm he and his wife own. Michelle Strang started her drum corps journey with the Buccaneers in 2016 at age thirteen as a member of the tuba section where she will be returning in 2017. Her father dragged her to the corps annual Friend and Family Day back in 2011 when she was nine years old and has wanted to march since then. At age thirteen Michelle was a little young to participate in a DCI corps. DCA offered her the opportunity to get experience with drum corps as well as a time commitment that she was able to work with. Starting her second season with the corps, she has met some extraordinary people and made some great new friends as it feels like home away from home to her. When asked about being a member of the Buccaneers means to her, Michelle’s answer was similar to her fathers. “The Buccaneers have won their fair share of titles, but more important than the titles, is learning how to be the best you can be and how to push yourself beyond the boundaries you have set for yourself. The 2016 season did not end with a title, but I walked away having had the best experience of my life “. Initially, marching alongside her father, Rich provided some pointers to help her understand what was being asked of her from the staff. Towards the end of her first season she was giving her dad a pointer or two! When not doing drum corps Michelle likes performing with her high school band and having an interest in photography. To wrap up the article on the Strang family, I want to use the comments from Rich that pertain to family and drum corps. Rich stated, “I can’t say enough about the Reading Buccaneer organization. My daughter was thirteen when we signed up together for the 2016 season. I’d be lying if I said I wasn’t a little nervous at first. How would she hold up playing tuba? Was her body strong enough to handle the drill? How would she handle getting instructions from the adult staff? How would she fair socially with college/adult aged membership? EVERYONE in the organization from the members to the staff and administration treated Michelle with respect and encouraged her. As a result, we had the most amazing experience together! “. Rich and Michelle Strang are experiencing drum corps together as a family and the bond between them is getting stronger. Drum corps remains an activity that is family orientated and can give its members a positive feeling at the end of the day.